Diabetes is a global illness. 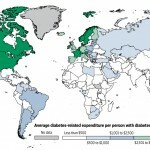 This map by the Wall Street Journal shows the diabetes prevalence and related expenditures around the world. It is no surprise that the United States and Europe show the highest diabetes-related expenditures when compared to the rest of the world.